Present state: The track, including the conductor rail, is still in place and very overgrown. The platform, fencing and lamp standards are intact. A small shelter stands on the ramp at the east end of the station. The starter signal post, complete with ladder, stands beyond the east end of the platform on the up side. One station sign survives: a 'Way Out' sign at the east end of the platform. Notes : On 4 December 1982, a new stop funded by the Football Trust, Watford Football Club and Watford Borough Council, was built on the east side of Vicarage Road to provide support for the increased crowds attending matches at the stadium: Watford had risen from the fourth to the first division under manager Graham Taylor for the first time in the club's history. The station consisted of a single pre-fabricated concrete platform costing £200,000 and was opened by Elton John in conjunction with Lord Aberdare. 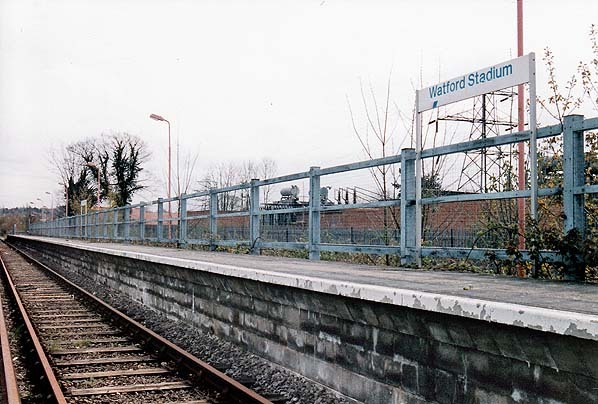 The station was sometimes referred to as Watford Stadium Halt, and this name was used on a contemporary street atlas. Although the station was on the east side of Vicarage Road and the club was in the same road, the entrance was at the other end of the platform at bottom of the ramp from where supporters were able to walk along a footpath to Cardiff Road, from where it was a short walk to the club's Vicarage Road stadium. This route kept them away from residential streets. The station was used only when Watford were playing at home. At appropriate times, a six-car EMU provided a non-stop shuttle service to and from Watford Junction, although on occasions the service train to Croxley Green stopped for the benefit of local supporters. Unfortunately, the success of the club at that time was short-lived, and so was the shuttle service. It is not known when the last train stopped at the station. A shuttle train ran for the match against Leicester City on Saturday 9 November 1991. 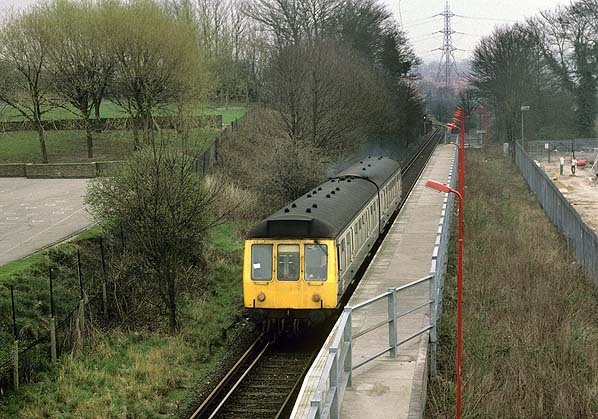 From 21 January 1991 the Croxley Green branch had been reduced to just three Monday-to-Friday round trips. Another shuttle was recorded running on Sunday 28 November 1993 for a game against Crystal Palace. The London Transport Users' Committee state that they ‘do not have any recollection of dealing with a closure hearing for Watford Stadium Station’, and doubt whether one was necessary as it was ‘a private station that was used only on match days’. When the line is reinstated as part of the Croxley Rail Link a new station will be provided on the west side of Vicarage Road replacing both Watford West and Watford Stadium. The station will be called Watford Hospital, but it will also serve the adjacent football stadium. Prior to the planning and construction of the Croxley Green branch, in July 1860 Lord Ebury obtained powers to construct a 4½-mile single-track line between Watford and Rickmansworth which opened in October 1862. The Rickmansworth terminus was located opposite the church to the south of the town where interchange sidings were provided with the nearby Grand Junction Canal (Grand Union Canal from 1928). The line ran from the LNWR at Watford Junction with one intermediate station at Watford High Street. further Act of Parliament had to be passed in 1863 to authorise the issue of further shares to the value of £30,000 (£40,000 worth of shares had already been issued). The line was worked from the outset by the London & North Western Railway (LNWR) who paid the WRR 50% of the gross earnings of the line.. The railway was never particularly financially successful and the Official Receiver was called in only four years after opening. Attempts had been made to remedy their financial problems by opening several freight branches, the most notable being to the Croxley printers and to the Grand Junction Canal at Croxley Green. The company was eventually absorbed in 1881 by the burgeoning LNWR whose station it shared at Watford Junction. Anxious of the growing influence of the Metropolitan Railway in north-west London, the LNWR added a short branch line to Croxley Green under the New Lines Act. Works commenced in 1908 and the new route opened on 15 June 1912. The semi-rural location of the Croxley Green terminus gave added credence to the LNWR's slogan ‘Live in the Country’. The extension involved the construction of a substantial bridge over the Grand Junction Canal. 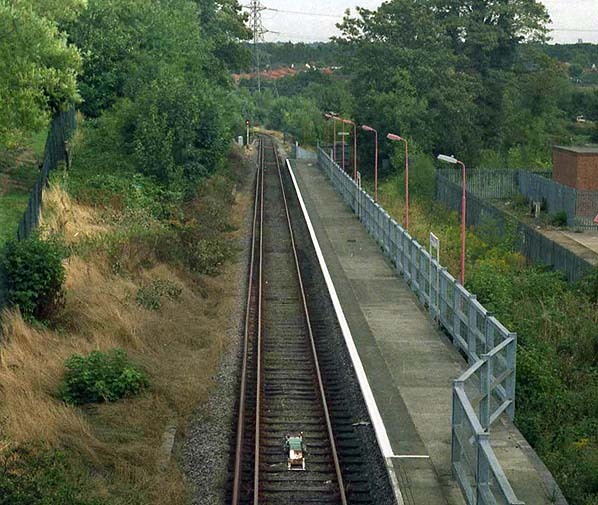 The short 1¼-mile Croxley Green branch left the Rickmansworth line at Croxley Green Junction which was substantially rebuilt as a double-track formation as part of the LNWR’s ambitious London suburban electrification scheme. There was one intermediate station at Watford West. It was always intended that the branch would be electrified as part of the North Western Electrics scheme, but the service opened with steam trains, often a rail-motor. The construction of the new lines in the Watford area was completed in 1913 and included a triangular junction with a spur enabling trains from Croxley Green to run south to Bushey and on to London. 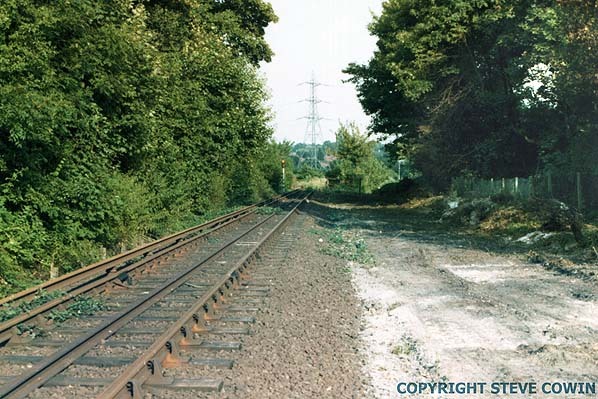 The western end of the curve retained the name Croxley Green Junction and included the junction between the Rickmansworth branch; the eastern end as Colne Junction. Adjacent to Croxley Green Junction a substantial new depot, known as Croxley Green sheds, was built to house the new electric trains. The opening of a two-track goods yard at Croxley Green enabled freight to be handled on the branch from 1 October 1912. Electric trains of Oerlikon saloon stock replaced steam on the Croxley Green branch on 30 October 1922. This marked the final stage of the LNWR’s London suburban electrification, just two months before the LNWR became part of the London Midland and Scottish (LMS) Railway on 1 January 1923. The new two or three-car sets operated 25 weekday shuttle services between Watford ]unction and Croxley Green. 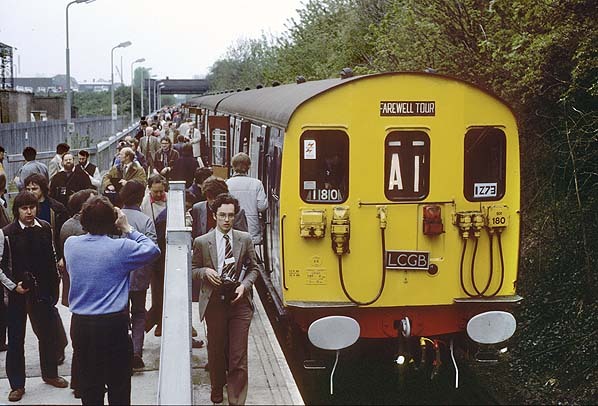 These were augmented by through peak hour services to London termini via the Croxley Green Curve: three up and two down trains served Broad Street while two up and four down provided the Euston service. This pattern changed frequently during subsequent years. Between 1925 and 1929 some additional through services ran between Croxley Green and Broad Street to serve the British Empire Exhibition (1925) and subsequent attractions at Wembley. In 1925 the Watford to Croxley Green local service, which had been weekdays only, was extended to cover Sundays. During the 1930s London tube stock was used on the Croxley Green branch. Joint LNWR/London Electric Railway (Underground Group) tube stock had been running on the Watford Junction to Elephant & Castle (Bakerloo line) service from 29 March 1920. They were found to be slow in traffic and were eventually replaced with standard underground stock. Nine of the 72 joint cars were transferred to the Croxley Green and Rickmansworth branches. For most of the 1930s the service on the Croxley Green branch was provided by tube stock although until 1938 normal (full size) stock was used on Saturdays to cope with heavier traffic needs, including shopping and Watford Football Club’s home matches. Towards the end of the decade 44 shuttle services were being provided on the branch, with four up and two down through trains serving Broad Street and three up and five down serving Euston. This service frequency remained until the outbreak of war in September 1939 when the passenger service was reduced and the tube stock was withdrawn. Most through trains to London were also withdrawn with some peak hour morning services continuing to run until early 1941 when just one through morning train remained. The frequent pre-war service was never restored after the war, with much of the line’s traffic lost to buses and the Metropolitan line which provided a much faster service into London. In June 1947 the Monday - Friday service was cut back to rush hours only, although one through service to Broad Street was reinstated with one up (towards London) service in the morning and a down train in the evening. At nationalisation in January 1948, the Croxley Green branch became part of BR’s London Midland Region. Initially the service saw little change although BR put on a second up through service to Broad Street. Two years later, however, the branch lost its late evening service. By 1953 the passenger service on the branch had been reduced to 32 Saturday and 22 weekday trains. In 1957 the ageing Oerlikon saloon stock was withdrawn, the last survivors of which had operated the Croxley Green shuttle. They were replaced with class 501 slam-door compartment EMUs. These did nothing to halt the decline; the Sunday service between Watford Junction and Croxley Green ran for the last time on 10 May 1959 and there were now 21 shuttle journeys between Watford Junction and Croxley Green in the Monday - Friday peak, and on Saturdays these were supplemented by one up peak hour trains and one down serving Broad Street and one up train to Euston. Through Saturday trains to London were withdrawn in September 1961. At the timetable change of 7 September 1963 the Croxley Green curve was illegally closed by BR. Prior to this there were two up Broad Street and one Euston trains on weekday mornings (including Saturdays) and one down Broad Street service on Mondays to Fridays; these were all withdrawn at that time. However from 18 November, on Mondays to Fridays, one up Broad Street train in the morning, and one down train from there in the evening were reinstated. Identified in the Reshaping of British Railways (‘Beeching’) report for closure in 1963, the formal proposal was published on 20 February 1964. On 20 April 1966 Barbara Castle, who was Minister for Transport at the time, refused consent to the closure between Watford Junction and Croxley Green. However she approved the withdrawal of trains between Croxley Green and Bushey & Oxhey, which took effect on 6 June 1966 when the single train each way to and from Broad Street (through Bushey & Oxhey) was withdrawn. In that year the service was further reduced to 14 down and 12 up trains on the shuttle service. Weekday shuttle services were maintained throughout the 1970s, although the Saturday service was withdrawn. In the early 1970s the whole system had been converted from fourth to third rail, apart from those sections shared with London Transport. In a surprise development in 1982 was the opening of a new station between Watford High Street and Watford West, only a few hundred yards short of the latter. Funded by the Football Trust, Watford Football Club and Watford Borough Council in an effort to ease road congestion on match days Watford Stadium station was opened on 4 December of that year by Elton John conjunction with Lord Aberdare. On match days a six car EMU provided a shuttle service to and from Watford Junction. Unfortunately, the success of the club at that time was short-lived and so was the shuttle service. This was one of a number of developments in the 1980s to this suburban system, none of which really succeeded in countering the impression that the Croxley Green branch was being run down. In 1986 the line found itself marketed as part of Network SouthEast following the introduction of class 313 saloon stock although on a number of occasions during 1987 and early 1988 a DMU worked the service, possibly due to a shortage of class 313 units. In 1988 an attempt was made to revive the fortunes of the Croxley Green branch by running a twice-hourly daytime service. This optimism was, however, to be short lived. From 22 January 1990 the service was reduced to Monday to Friday peak hours and the 1993 timetable shows just one return morning journey with no evening service. In 1996 Hertfordshire County Council was allowed to break through the embankment short of Croxley Green station to build a new dual carriageway called Ascot Road; this project severed the line just east of the bridge over the River Gade/Grand Union Canal. A temporary bus service was introduced on 24 March 1996 with the intention of reinstating the rail service after the work was completed; this was expected to be about nine months. In about 1989 London Transport floated the idea of diverting the Metropolitan line away from its remote west Watford terminus and, by means of less than a mile of new alignment, linking up with the Croxley Green branch to gain access to Watford Junction: this eventually became known as the 'Croxley Rail Link'. In March 2001 the Strategic Rail Authority, in collaboration with Railtrack and Silverlink Trains Ltd, published a proposal to officially withdraw the service between Watford ]unction and Croxley Green in June that year and to close the line between High Street Junction and the terminus, as well as the stations at Watford West and Croxley Green. The public notice recognised that since March 24 1996 ‘the scheduled passenger service has been provided by means of a substitute bus service’ and mentioned that ‘there is a prospective project .... to link the Metropolitan Underground Line to Watford Junction.’ The announcement concluded: ‘The closure of the Croxley Green branch would enable its use for that project.’ A closure date of 18 June 2001 was proposed but this could not be met as the SRA received 34 objections. Despite these, the Department of Transport approved closure in a letter dated 6 November 2002 which also stipulated that track and formation must remain intact for five years. No closure date was specified and Silverlink Trains continued to run a replacement bus service. In November 2002 it was reported that the branch had been deleted from the Network. From 29 September 2003 the replacement bus service (in practice, a taxi on demand) was withdrawn at the start of the autumn timetable – 71/2 years after the last regular train. In September 2005 all points, signals and associated equipment, including the trailing connection at Watford High Street, were recovered from the branch. All the track and remaining bridges remained intact. The Croxley Rail Link in its current form involves the ending of passenger services between Croxley and Watford Underground Station. As this constitutes a proposal to close a route to passenger services, and to close a station, a formal closure process involving London TravelWatch is required. The London TravelWatch Board have set up the Watford Station Closure Panel. The panel held a public meeting in Watford on 14 June 2012. Construction work is expected to start in June 2014 and be finished by January 2016. When the Croxley Rail Link is built, direct services into Watford Junction from Amersham would also be possible, thus linking the commercial centre of Watford to the new developments in Aylesbury, as well as providing the Chilterns with transport connections, via the Junction, to the North and other destinations. The Croxley Rail Link will require the construction of the 'missing link' between the existing Metropolitan line and the Croxley Green branch. 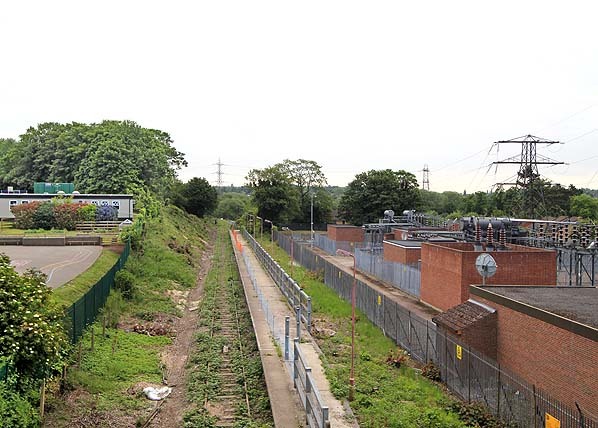 Under approved plans, the link would begin at a new junction near Baldwins Lane, about a kilometre north-east of Croxley (Metropolitan line) station, and be carried via a new viaduct and bridge over the Watford Road dual carriageway and the Grand Union Canal. 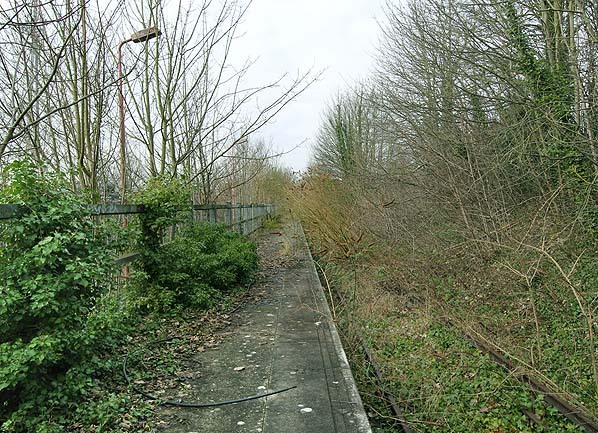 This would then join onto the former Croxley Green branch where new double track would be laid on the disused trackbed up to Watford High Street station. The submitted proposals also detail the addition of two intermediate stations to the line - both new constructions. 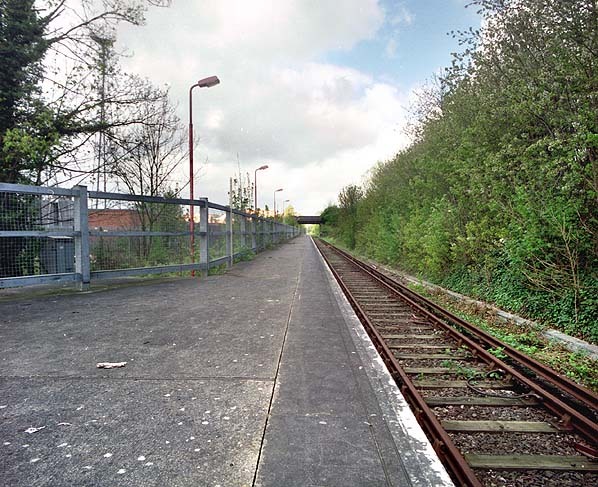 The existing, but closed, Croxley Green station would be replaced with a new Ascot Road station close by. A second new station would be opened on Vicarage Road, to be called Watford Hospital; this would also serve the football stadium. This station will replace both Watford Stadium and Watford West. Both of these new stations would be provided with full Underground facilities with the exception of a staffed ticket office; ticket machines would be available instead. A further proposal is to use an existing but seldom-used chord towards Amersham via Rickmansworth which would allow direct services to and from central Watford, thus improving local public transport in Hertfordshire and Buckinghamshire. Under this proposal, Amersham trains would run along an existing viaduct which connects Rickmansworth to the Watford branch of the Metropolitan Line south of Croxley; from there, services would continue along the proposed new viaduct to the Croxley Green branch Line and on to Watford Junction. 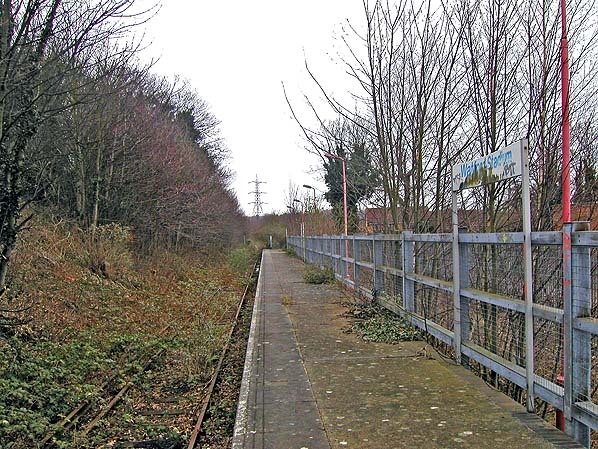 For more pictures of Croxley Green and the Watford - Croxley Green branch line see the Abandoned Tube Stations web site. Tickets from Michael Stewart and Brian Halford. Route map drawn by Alan Young. Bradshaw from Nick Catford, Temporary replacement bus timetable Chris Totty. Totem from Richard Furness. The Rail Chronology web site. There has been much debate about the closure date of the branch. This web site clarifies the closure process. Site preparation work for the new Watford Stadium station being carried out in July 1982. Although Watford Stadium station is shown on some contemporary street atlases it does not appear on any OS maps; however it has been added to this map. 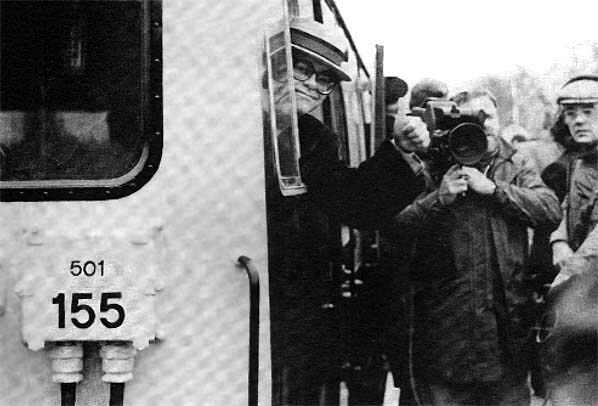 Elton John, then chairman of Watford FC, in the cab of the first train on the opening day of the new station. A large crowd gathers on Watford Stadium station after the arrival of the LCGB/SEG 'The First & Final 501 railtour' on 11 May 1985. A Class 313 passes a very clean Watford Stadium station with the 16.07 Watford Junction to Croxley Green service on 9 April 1986. A Croxley Green-bound DMU passing the Watford Stadium platform in August 1987. The train was still showing the tail lights from the previous up journey. The photo was taken from Vicarage Road overbridge. Under plans for the Croxley Link scheme a new station would be sited on the opposite side of the bridge. 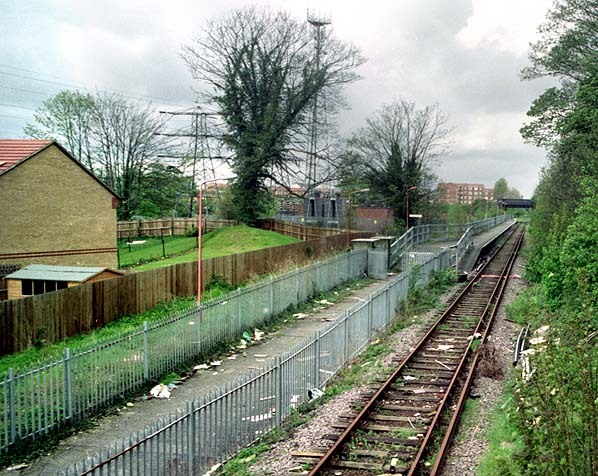 Watford Stadium station looking east from Vicarage Road in September 1994. 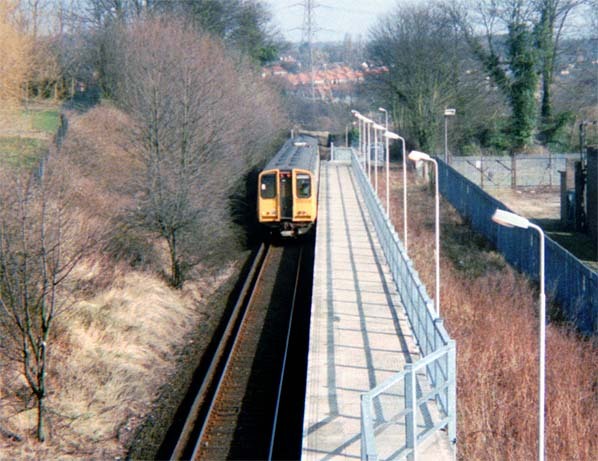 Watford Stadium station in April 1998, two years after the service was suspended. 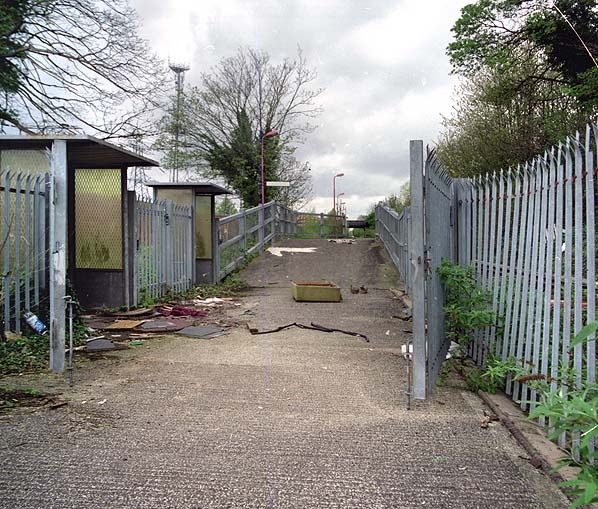 Watford Stadium station looking west in April 1998. Vicarage Road bridge is seen in the distance. Watford Stadium station looking west from the signal post to the east of the station in April 1998. The path led to a public footpath to Cardiff Road. The route allowed fans to reach the stadium without passing through a residential area. The entrance to Watford Junction in April 1998. Note the two bus shelters just inside the gate. This was the only weather protection at the station. 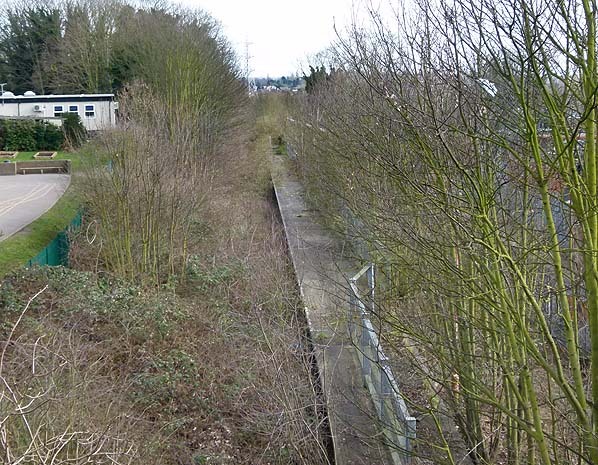 Looking west at Watford Stadium station from Vicarage Road bridge in March 2011.
is now hidden by undergrowth. 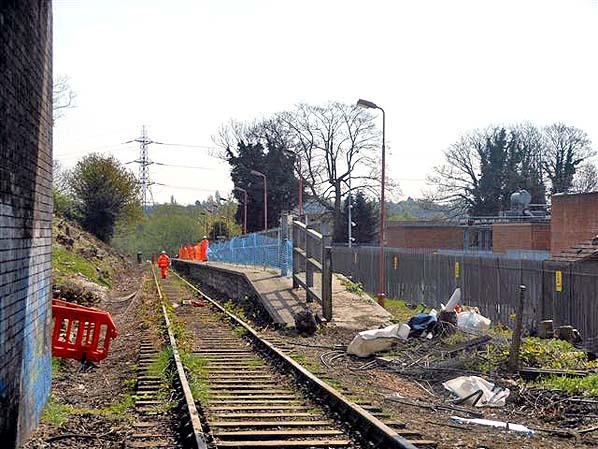 Watford Stadium station looking east in April 2014, shortly after the track had been cleared of undergrowth as part of the preparatory work for the Croxley Rail Link..
Watford Stadium station looking east from Vicarage Road bridge in June 2014.